All it takes is the right kind of display or serving set up to make an 'okay' dish into an awesome experience. Sure, you can use basic white dishes for most things (I do! ), but there are times when that simply won't do. This week's Friday Favorites is all about those cool serving dishes. This pink lacquer tray is just right for serving appetizers or laying out cheese. I love these wooden berry baskets with the pink rim for baked goods. Yes, this actually is a ceramic dish! You have to check out the options on this site, but my favorite dish is the cantaloupe. Serving crunchy snacks like seasoned nuts? 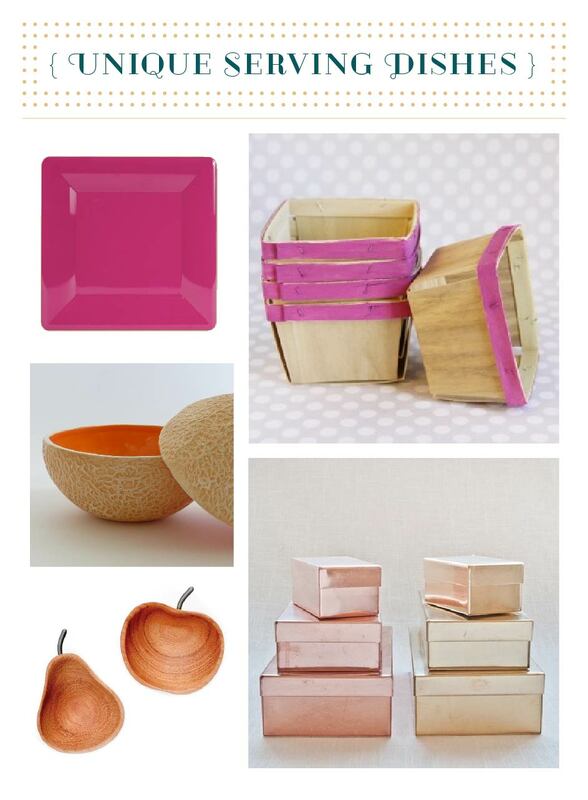 Keep these wooden pear shaped and apple shaped bowls on hand. These metal boxes have serious potential. Lay a linen napkin inside to serve fresh bread, or keep whole fruit on the counter.